“This is the chase: I am gone for ever,” proclaims the old shepherd Antigonus in Shakespeare’s The Winter’s Tale, immediately before that most famous stage direction: ‘Exit, pursued by a bear.’ And he does go forever, because the bear mauls and munches him for a tasty snack, and doubtless eventually deposits him as skubalon in some Sicilian woods, as bears do. Blairs, however, have a habit of never going away. If they’re not trying to follow in father’s footsteps or using daddy’s contacts to forge a career or fighting some great cause of equality, they’re trying (and failing) to bring peace to the Middle East, or applying to become ‘President of Europe’. And that’s what Tony Blair’s latest Brexit intervention is all about. Well, maybe not ‘all’: perhaps he really does believe that Britain will be all the poorer for leaving the European Union, and that more powers really should be be given to Brussels and that mass (uncontrolled) immigration is actually very good for the UK. He’s never been one not to bend his convictions to his politics. And he is a genuine pro-European, anti-State, anti-individualist, socialist, federalist, ‘third way’ Catholic-ecumenist. And now he calls all EU ever-closer Remainers to become “insurgents” against the rabid Brexiteers who are pushing the UK toward ever further detachment into political oblivion and economic ruin. The will of the people must be respected, he insists, but that will must surely change. They voted Brexit (just about) because they didn’t quite grasp the “catastrophic” (his word) consequences: “they’re also open to a better argument in the light of the facts as they come to light”. As the pound sinks, inward investment dries up, banks depart the City, the NHS collapses, children starve and the moon turns to blood, the people will see that Brexit is not the land of milk and honey which Brexiteers promised. Britain must retain its “essential social democratic” model, Blair insists, hinting that a new progressive ‘third-way’ alliance must arise after the fashion of continental Christian Democracy (ie New Labour revived). So out goes the “free market, free trading, light regulation, low tax, low social protection” Brexit vision, and in comes the anti-competitive, collectivist, bureaucratic, environmentalist, corporatist social doctrine more attuned to Blair’s apprehension of Catholic Social Teaching. He doesn’t seek to impose this upon the people: it is a case of turning their eyes to the light so they might see and understand for themselves. 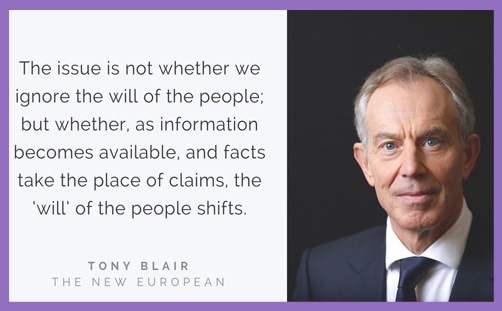 “The issue is not whether we ignore the will of the people, but whether, as information becomes available, and facts take the place of claims, the ‘will’ of the people shifts,” he explains. Isn’t that the essence of democracy? Some lose, some win; some are in, some are out. Isn’t it then for the minority to accept the will of the majority? So democracy is to be subverted by the ever-circulating elite, intent on making sure the people get what’s best for them. Indeed there is. The vision of an ever-closer European Empire ruled by one Emperor belonging to one Church under one God was once emphatic. But it has passed away: the British people have opted for a new resolution. We are sorry if that doesn’t quite cohere with Tony Blair’s mantle of divine right.